You are already, surely, a devout reader of Ken Davenport’s blog The Producer’s Perspective. And what about Did He Like It?, the ingenious way to track all New York Times reviews (and also other outlets) in one place – also by Davenport. Now. There is also an iPhone app for Did He Like It? Have you downloaded it yet? No? So. Now that you have it – glory in its functionality. In one simple app, you can find any show and see what the all mighty NYT thought of it. Pretty cool. The app shows just how easy getting the info you want should be – or already is. Putting on the new product hat… Imagine a single app with all reviews for shows anywhere in the world. You simply search by city, show, playwright, etc. 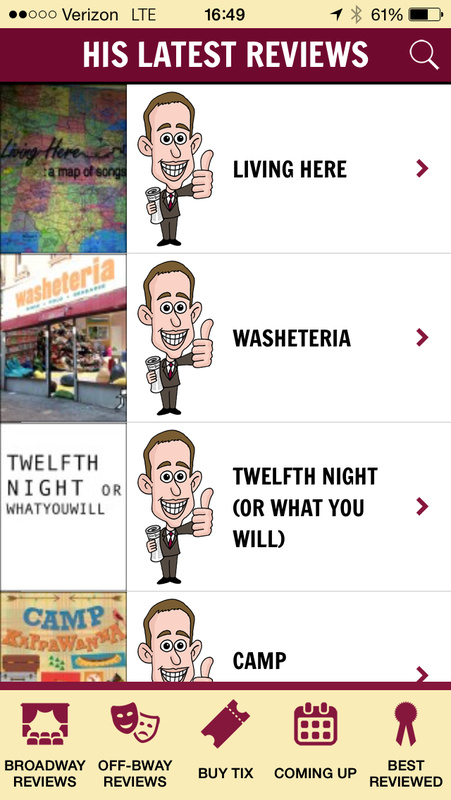 You can set up alerts so that you get reviews for any company, theatre, playwright, actor etc. you care about. Now that would be powerful. Right there on your phone – the Ben Brantley action hero.